This past weekend was an adventure for us as it kicked off Birthday Marathon Week. The Handy Man and I are poor planners blessed to have so many big events in the span of a short time: my birthday, Star Child’s birthday, Dee’s birthday, our wedding anniversary, and then Little Princess’ birthday all occur within a nine-day span of time. We really like cake here, but after birthday marathon week, we are all sick of cake! I have taken to asking the girls not to make me birthday cake. I get cheesecake instead. I feel that is a good trade-off. We made it a policy to only have parties for milestone birthdays once our children reach a certain age. This year–today, in fact–we celebrate Star Child’s 16th birthday. She decided that what she wanted was a slumber party with nine of her closest friends. Our good friends Patty and Tom have a beautiful house (which is for sale!) 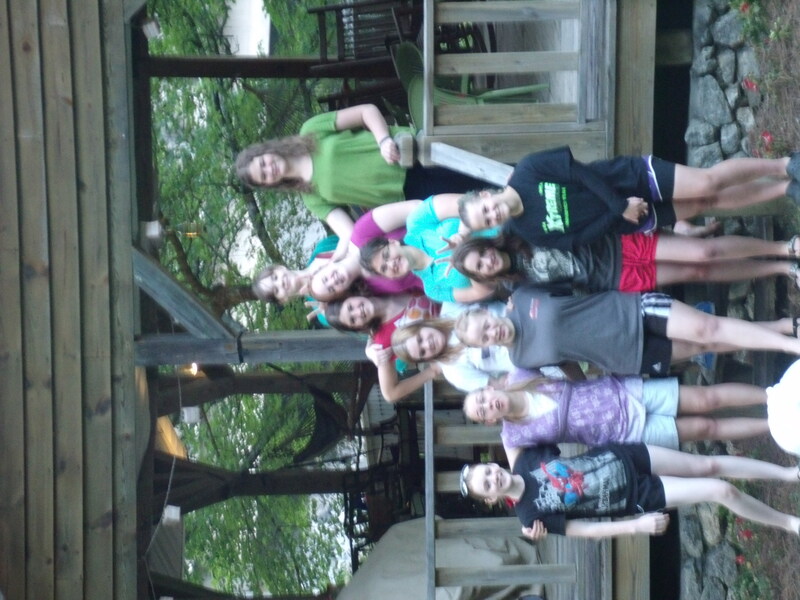 up on Lake Rabun, and they have a great boat house that they allowed us to use for the day of the party. We borrowed a back seat out of our friends’ van (we have a 15 passenger van, but we have never had the last seat–we like it that way because we need the cargo room) so we would have enough seats for 12 of us. A few of Star Child’s friends met us at the lake, and the rest of us drove up together in the van with our picnic. 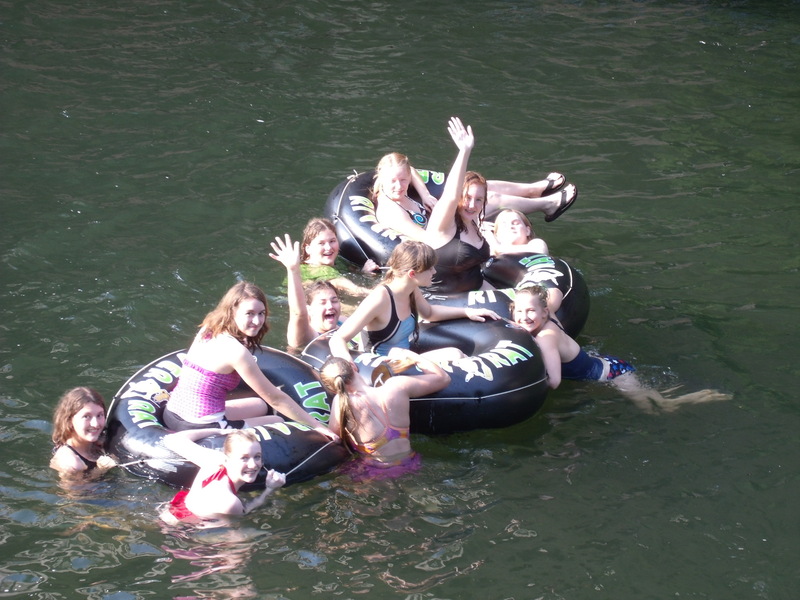 The girls had a blast taking the big tubes and floating down the river, then walking back up to our location and doing it again. They were so funny! We cooked out and drank lots of sodas and just had a great time. Two of the moms who met us up there stayed, and since they are both good friends of mine, I had a delightful afternoon, too. Most of Star Child’s guests are home-schooled, and most of them come from large families. 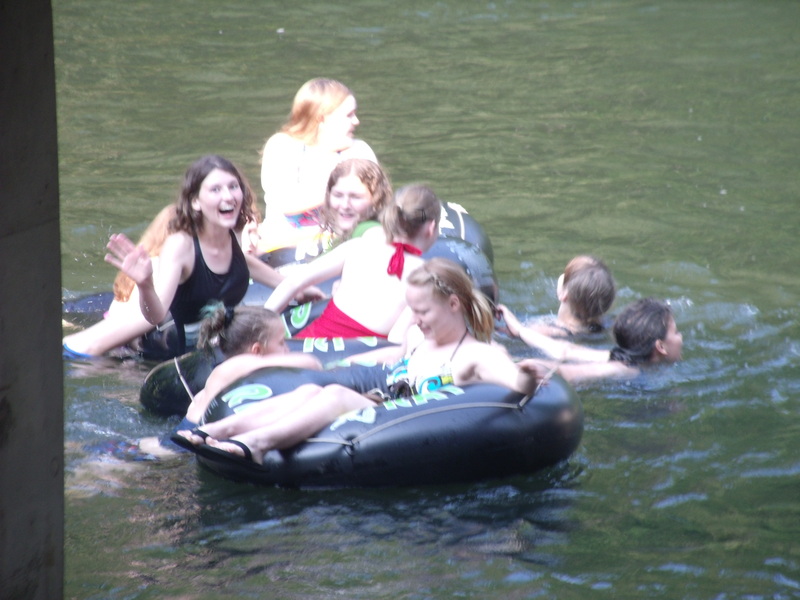 When you get a bunch of teen girls from large families together, the dynamics are a bit different than they are with groups of girls from small families. Between Star Child and the eight friends who came to the party, they had a combined 40 siblings! I loved the fact that when I called for the girls to load up, no one complained. I handed out bags and coolers, and they magically got loaded into the van. When we got back to our house, the girl unloaded the van, and when I asked for the cooler to be emptied, it was done in thirty seconds flat. I made a general comment that we needed to get the wet towels and bathing suits washed, and one of the girls (not one of mine!) trotted down to my laundry room, switched over my laundry, and put the wet towels and bathing suits into the washer. She then came to get me because she didn’t know how to start my washer, and she was unsure of what to do with the basket of clean clothes. The boys were very excited to have so many laps upon which to sit, and it was sweet to see that the girls were mostly happy to let the boys feel some lovin’. We had cake and ice cream, and then Star Child opened her presents. The standing not always funny joke in our house is that Star Child LOVES to pop bubble-wrap. I have to guard the bubble wrap that cushions my Christmas decorations when we get them out in December or she will pop it all. Popped bubble-wrap=useless bubble wrap, as we all know. 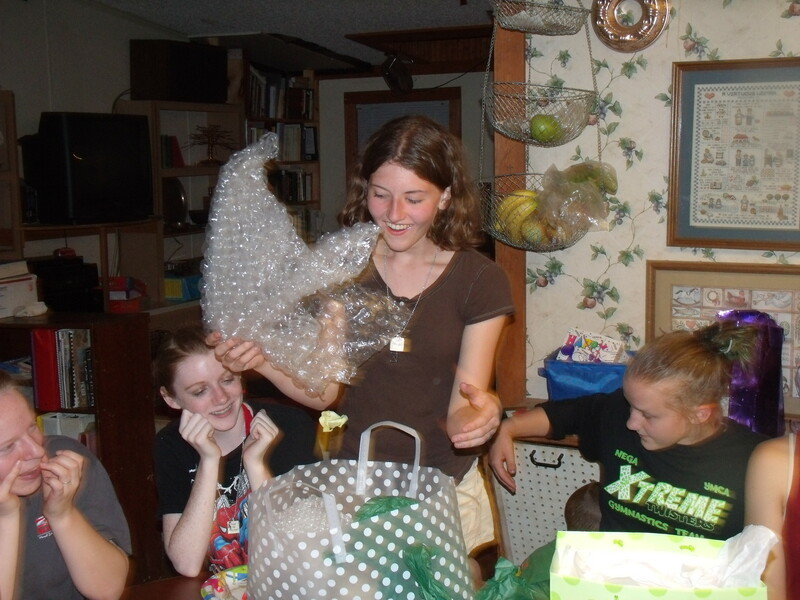 So it was with great hilarity that TWO of her friends got Star Child bubble wrap for her birthday! Talk about a bunch of goofy girls. They had their time of singing around the campfire and being silly after that. I am sure that the neighbors wondered what in the world was going on up here on the mountain. That night, one of the girls got tired and put herself to bed at about eleven. The rest of the girls stayed in the camper to watch Alice in Wonderland, and then three others came inside to sleep while the rest slept in the camper. A few stayed up way too late talking and giggling, but it seems that most of them got some sleep. Sunday morning I got them all up while breakfast was cooking. They all made it to breakfast, and in fact helped clean the kitchen before we left for church. I dropped two of the girls off at their respective churches, and a third girl’s mother met us at our church, where we traded her daughter for Little Princess, as Little Princess also had a spend-the-night adventure while her sisters partied. It was exhausting because of all the work that went into the weekend, but I would do it again because the girls were such a pleasure to have in our home. 5. Have I mentioned that they are silly and so very sweet? Don’t tell my girls, but we may have to have another slumber party again this summer. We just need to wait until I have had sufficient time to recover from this one.